The port, with its own life and market activity, is the apropriate place for enjoyable walks. To the left side, of the port stands St. Irini, a chapel of amazing beauty. The path from St. Irini leads to Valmas and then to Kolitsani, two small, remote sandy beaches. If you feel too tired for walking, you can make a stop to cool yourself in the long beach of Gialos to the right of the port, where you'll also find many restaurants, bars and cafes. The main residential area is Chora, with its narrow streets, wisely oriented, so as to -protect from the open sea winds, with covered spaces to shelter from the strong sunbeams of summer and the heavy rainfalls of winter. The site of the village is on the hill-top, first so as to make it possible to see the pirates approaching and take evasive action, and second to secure even the smallest piece of land where a crop might be planted. Exploring Chora means, first of all, walking. Choose a cool morning, wear your most comfortable shoes and get ready to set off. One hour is enough for the ones who just want to have a look at this whitewashed village, perched on the slope of the hill between the port and Mylopotas. The more demanding ones will need the whole morning to discover the hidden beauty of Chora. That's because Chora was built up for the sun and it's the sun that reveals the village to the visitor or hides it from him. To go up to Chora, just follow the wide stone steps of the old ascending road that comes from the port. On your way, right before entering the village, you will come across a part of the walls that once surrounded the ancient town. Following the same road you reach the first square of Chora. To your right stands the modern Orthodox Cathedral of the island, named Evangelismos (Annunciation). To your right there is the marketplace and the two main roads that lead you across the village and to the square of the mills. Following the road that goes up, you reach the second square of the village, with its four cafes. On the left side coming from this square, the stone steps lead to the old castle of Chora, where the sublime church of Panaghia Gremiotissa (Our Lady of the Cliffs) is situated. This might sound like the perfect setting for a peaceful relaxing holiday, but first impressions can be deceiving because during June, July and August, once the sun goes down, this quiet port and the typical Cycladic looking village that overlooks it from the hill above, literally rocks all night long. Those innocent little white geometric houses open their doors to become discos, bars, rock clubs, boutiques, snack bars, cafes, restaurants and anything you need to cause or cure a hangover. Ios is the only island in the Cyclades that has so many windmills gathered in one place. This is one of the most beautiful sites on the island and forms a unique sample of traditional architecture. Three of them have been renovated by the municipality. Above Chora on the slope the twelve windmills remind you of former days, when the islanders used the power of the wind to make their windmills work! Paleokastro (literally meaning "old castle") a Byzantine Castle 300m above the sea, lies in the eastern part of Ios Island on the top of the island’s highest hill. On taking the road back from Pirgos, you will end up on the beautiful, winding, stone paved road to Paleokastro. What looks like a scenically blessed place used to be a fortified area and was originally constructed to protect the local population from frequent pirate attacks. The area is completely desolate now but the ruins left behind allow us to have a glimpse of what life might have been like in the Middle Ages. The most distinguished sight is that of a Venetian Castle dated back to the 10th Century. It is made of marble and surrounds a beautiful Byzantine chapel, the church of Panagia Paleokastritissa (Our lady of the Old Castle). 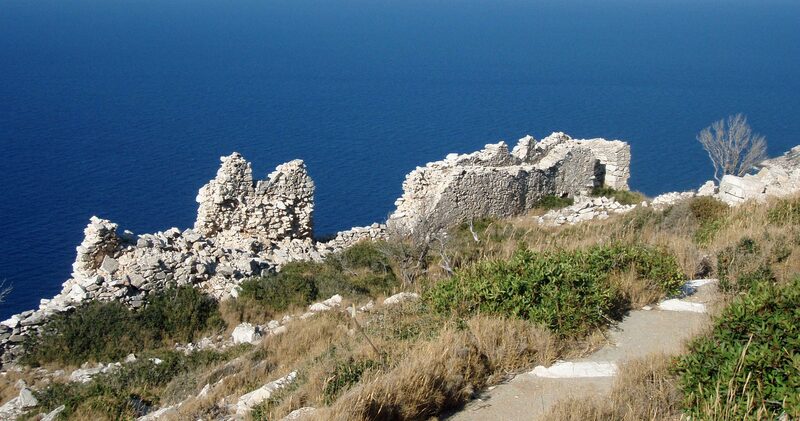 A great part of the Castle wall has already slid down the cliffs into the sea but a few walls still remain. The ruins might not be in the best of conditions but this is one place you do not want to miss. The past comes alive here and takes you back in time. There's a path that leads to the ancient ruins of the ancient town of Plakotos at the northernmost end of the island, dating from the Hellenistic period, where tradition claims that the tomb of the poet Homer lies. According to Herodotus, the 'poet of poets' Homer was buried at Plakotos, in the north of the island. Pausanias tells us that there was an inscription at Delphi confirming the poet's interment on Ios, which was the homeland of his mother, Clymene. Excavations (excavation periods 1986 to 1995) on Skarkos hill unearthed a prehistoric settlement, proving that Ios has been inhabited since the early Cycladic period. The architecture at Skarkos is preserved in places up to a height of almost three meters, with most of the buildings evidently having two storeys, stone-paved floors and a sewage system. Numerous well-preserved pottery, tools and utensils made of metal, stone and bone were also discovered. In 2008, Ios was among six European locations (out of 109 candidates) awarded the European Union Cultural Heritage prize for its exceptional conservation efforts at the archaeological site of Skarkos The Early Bronze Age settlement is a privileged one, situated on a hill in the middle of the west side of the island of Ios, beside one of the safest and most spacious sheltered harbors in the Cyclades and the most extensive arable lands on Ios. It has a concentrically organized town plan, wide streets and squares and stone-built rectangular, two-storied, buildings. The buildings bear witness to an agglomerative manner of construction. The settlement was enlarged by the construction of new buildings which were added to preexisting ones. In this manner were created large architectural complexes or insulae whose individual houses were independent from each other, separated by double walls between them. The buildings are quite sophisticated for the 3rd millennium Aegean. Most of them have upper storeys the access to which was provided by means of stone-built exterior stairs. The abundant movable finds are very interesting and in combination with the architectural remains give a picture of the function of the rooms of the buildings. Each house includes spaces for special activities such as cooking areas on the ground floor and/or the adjacent court, and rooms for agricultural and pottery storage on the upper floor. Many of the artifacts were not attested in the Cyclades until the excavation on Skarkos. The majority of the pottery belongs to local fabric groups. The more characteristic forms of fine wares are the sauceboat and the saucer. Very interesting is the great variety of household coarse wares. As yet, very little is known about these wares of the Early Cycladic period. Potters' marks and matt impressions on the bottoms are common features of Skarkos vases. There are, also, a considerable number of imported wares. They are imports from Thera, Melos and, in some instances, from Mainland Greece, namely from East Attica or Argolid-Corinthia. Terracotta artifacts such as spindle whorls and pierced disc-shaped objects made of sherds were found at the site. A series of oblong objects pierced by two holes are of particular interest. Some of them have a circular seal-impression in the center of their upper flat side. Their designs resemble the sealings from Lerna and contemporary seals from Crete. A great variety of stone artifacts (circular lids or stands for vessels, palettes, mortars, querns, various implements), mostly made of schist, gneiss and marble have been uncovered at Skarkos. Obsidian technology was also well-developed. A considerable number of small schematic marble figurines have come to light. Pointed bone tools as well as bone tubes, either undecorated or with incised patterns were found in the settlement. Examples of lead and bronze objects are few. Another area to which Skarkos excavation offers valuable evidence is the subsistence economy. Agriculture (cultivation of cerials and pulses) and pastoralism (breeding of sheep and goats) played an important role in the economy according to the plant and animal remains. It appears that Skarkos was self-sufficient in terms of food. However, there is evidence that the site participated in EBA exchange networks and had developed connections with sites on other Cycladic islands, Mainland Greece and other parts of the Aegean. The evidence suggest the existence of internal organization and social ranking within the Skarkos community. Some of the houses are larger and more complex than others. Craft specialization existed in the settlement. In some instances a statement of ownership or personal identity was necessary, as we see in the vessels bearing potters' marks and the seal-impressed oblong terracotta objects. It was inaugurated in 1997 and built from marble and local stone. It is located in an area called “tsoukalaria” further up the traditional windmills in Chora. It is a colossal structure and can hold up to 1100 people at any given time. The theatre is dedicated to the Greek Poet of Aegean "ODYSSEAS ELYTIS", Tsoukalaria was the poet’s meditation and inspiration place and that is why the theatre that bares his name stands there today. Odysseas Elytis was considered to be a revolutionary Greek poet who wrote modern and defining poetry unlike other poets who used ancient Greece as a source of inspiration.